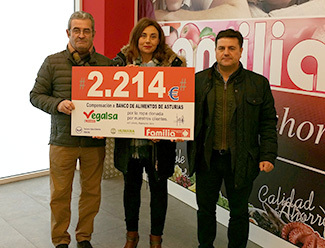 Humana Fundación Pueblo para Pueblo and Vegalsa-Eroski have delivered a total financial contribution of 19,168 euros to four Galician social organizations: the Arela Association, the Hermanos Misioneros de los Enfermos Pobres de Teis, both from Vigo, and the Citizen Association of Fighting against Drugs (ACLAD) and the Hogar Santa Lucía Foundation, of A Coruña. The delivery took place in two events held at the Eroski / Center of García Barbón (Vigo), and the Eroski Center of Vioño, in A Coruña, respectively, in which representatives of the entities involved were present. The Arela Association, founded in 1998, focuses its action on the integral development of children and adolescents in vulnerable situations, promoting prevention and intervention initiatives in these situations. For their part, the Missionary Brothers of the Poor Sick of Teis have the vocation of assisting people in social exclusion in the area of ??Vigo. 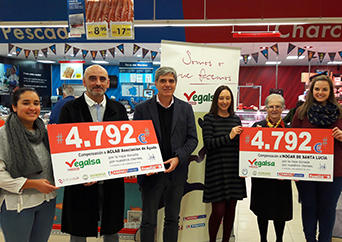 In addition, both entities have delivered a contribution of 2,214 euros to the Food Bank Foundation of Asturias in a small event organized by Autoservicios Familia La Florida, in Oviedo. 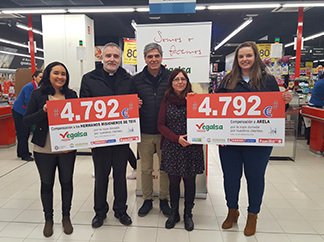 These contributions come from the funds generated with the management of the used textile collected in 2017 in the containers installed by Humana in 58 Eroski / Center, Eroski / City and Family Self-service establishments throughout Galicia, and in centers in Asturias. This is another example of how, through proper management of the textile used, it is possible to develop local support programs in the municipalities in which the Foundation is present, either in direct collaboration with the town halls or, as in this case, through from a private collaborator like Vegalsa-Eroski. It is a sign of Humana's commitment by reverting part of the resources generated with the management of used clothing to citizenship. For example, in 2016, 417,395 euros were allocated to these programs.